Gulzar Khan is in his early 30s. He inherited a thriving garment business from his father, the late Waqar Khan. It is located in Bareilly Compound in Dharavi, Mumbai’s melting pot of subcontinental migration, hyper-density and street-smart economic activity. The lane got its name from the artisanal communities who migrated here from the once thriving manufacturing and trading hub in Uttar Pradesh. At the peak of his career, Waqar employed dozens of workers in his workshops and showroom, subcontracting jobs to other establishments. He produced shirts to be sold in Mumbai and Goa, where the family owns shops. Dharavi was ignored by financial institutions for decades. This explains why it was customary for businessmen like Waqar to put their cash in the hands of people from the community who needed it to start their own businesses. A neighbourhood celebrity, he belonged to a generation that had seen Dharavi at its worst but firmly believed that social and economic improvements went hand in hand. Waqar became famous in Dharavi for his involvement in the communal harmony movement, which encouraged dialogue and reconciliation after the riots of 1991-92. After Waqar passed away in 2009, Gulzar had a hard time recovering the undocumented loans his father had given to neighbours, secured only by community ties, trust and his own charisma. Today, the workshop and showroom have been rented out to newcomers dealing in leather. Gulzar has changed his business modus operandi. For a while he operated from a small office at the back of a mobile phone repair shop. Instead of producing everything from Dharavi, which is becoming more expensive as wages and rents rise, he buys his inventory from fellow Bareillites who have set up shop in Delhi. There, space is cheap and the workforce abundant. He takes orders on Whatsapp. Reportedly, dozens of workshops have sprung up on Delhi’s outskirts and smaller towns like Bareilly, mostly initiated by the same families who migrated from Mumbai two or three generations ago. Smartphones and cheap transportation allow small businesses to do what multinational corporations have done for long: manufacture goods far away from their consumers, taking advantage of wage and price differentials, and possibly undercut local regulations. The rapid absorption of smart technologies is transforming how business is done all over India. An increasing number of garments, embroidery and leather goods producers are taking orders online. 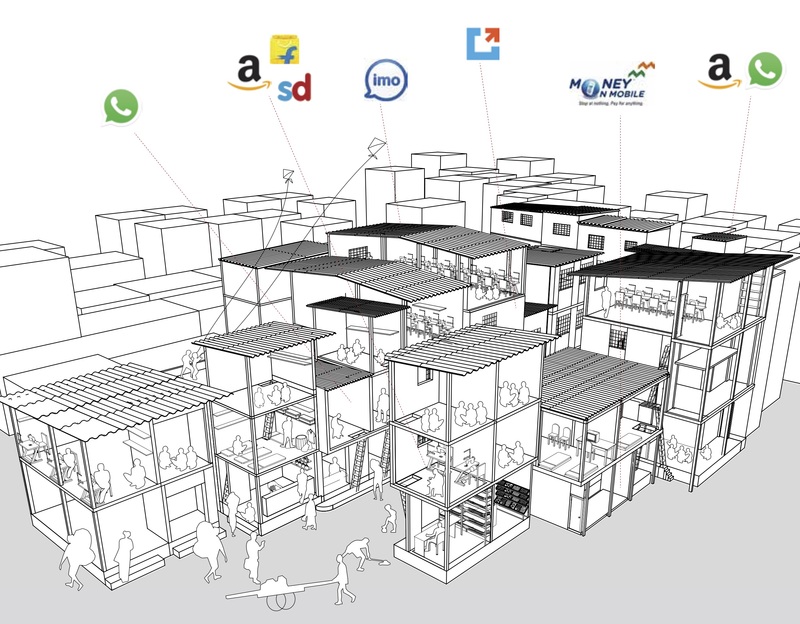 In Dharavi, and elsewhere, businesses that are not tech-savvy are left behind, while those that are expand their consumer and supplier base. Sadly, instead of promoting new technology where it has the potential of impacting the greatest number of people, the powers that be still treat neighbourhoods like Dharavi as rogue settlements. Policymakers turn a blind eye to what they represent in terms of employment and innovation. There is no way “redeveloping” fragile habitats, or demonetising them for that matter, helps those who struggle on a daily basis to improve their conditions. It only makes things more difficult. Gulzar belongs to a tech-savvy generation, and his smartphone is an essential part of his trade, along with cash transactions. The recent cash crunch tripped him, like it did half the economy, but he didn’t fall. If anything at all, his Dharavi upbringing taught him to think on his feet. Against the face of technocrats and their “slum free”, “cash-less”, “smart cities”, Gulzar continues to make his moves. He has started selling fashionable jeans made in Delhi to youth in Dharavi and just opened a grocery store. He says that the local market has matured and has developed a strong consumer base. Who’s smart now?